Francis Phillips has written a very fitting obituary for Alison in the Catholic Herald for which much gratitude is due. Alison Davis was born with spina bifida. She later developed conditions including osteoporosis, arthritis and chronic obstructive pulmonary disease. Coping with these permanently disabling and painful conditions dominated but did not define her life. Indeed, they led her to champion the rights of the vulnerable, the disabled and the unborn, first as an atheist and then as a Catholic. 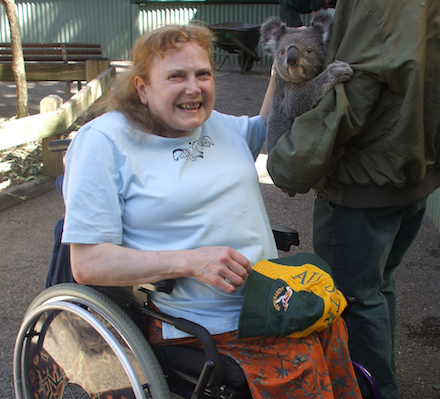 Her early adult life was marked by a determination to live as normal a life as possible, despite having to use a wheelchair. She studied sociology at university, where she stopped believing in God. Writing about this period of her life in a paper she delivered to a New Zealand Family Life International Conference in 2009 she was honest: “It was largely because I wanted to live a lifestyle I knew was incompatible with the Christian faith.” She married young, in 1975, but after ten years in which she “tried very hard to find happiness without God”, the marriage failed. At university Alison had strongly supported a woman’s right to choose abortion but her attitude changed after she read of the case of a baby girl, Louise, born in 1979 with the same disabilities as hers, who had been deliberately starved and dehydrated to death by Dr Donald Garrow of the High Wycombe Hospital. The case, which received wide publicity at the time, shocked her to the core. In 1981 the Guardian published a letter in which she criticised the killing of newborn disabled babies. 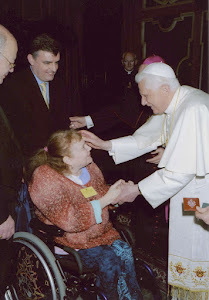 The Society for the Protection of Unborn Children (SPUC) contacted her and argued that killing the newborn disabled was a consequence of killing the unborn. Alison was reluctant to give weight to SPUC’s arguments but within a couple of years she accepted them and became pro-life. From 1983 Alison worked full-time for SPUC’s newly developed Handicap Division (its name was later changed to No Less Human), for disabled people as well as their families and carers, and became a major commentator on anti-life policies which discriminated against disabled people. In 1985 her marriage ended and in the following years a number of serious personal difficulties resulted in her making several suicide attempts. Yet paradoxically, she also started to search for religious belief. Having studied other world faiths, she turned to the Bible. “I began to think it could just be true,” she wrote. In 1986 she went to Scotland to stay with the prominent pro-life priest, Fr James Morrow of Humanae Vitae House in Braemar. He taught her to say the Rosary and she attended Mass in his chapel. Yet the road to the Church was not easy and Alison still struggled to find meaning in life. Joining a pilgrimage to Lourdes she began to understand that she and the other sick people there were very much loved by God in their suffering. In 1987 she met Colin Harte who was working for SPUC. From 1989 he was her devoted companion and carer for the rest of her life; indeed, it was Alison’s conviction that pro-lifers should not compromise and exclude disabled babies in attempts to lower the abortion upper limit (as happened with David Alton’s 1987-88 Bill) that led Harte to question the whole basis of incremental legislation and to write his own book on the subject, Changing Unjust Laws Justly; Pro-Life Solidarity with the Last and the Least (2005). During a second pilgrimage to Lourdes Alison learned for the first time that suffering need not be wasted; it can be offered up to God on behalf of others. She became increasingly drawn to Christ in the Blessed Sacrament. Finally, on Easter Sunday, 31 March 1991, she was received into the Church. Although Alison knew she had “come home”, being a Catholic brought its own difficulties. She discovered some churches couldn’t accommodate wheelchair users and she sometimes experienced an acute sense of rejection. She learnt that her Faith would not remove the sorrows of life but that it does provide the grace and strength necessary to live with them. A visit to Calcutta over Christmas in 1991, and witnessing the love a pavement-dwelling family had for their tiny baby, brought home to her the infinite value of each human being created by God. 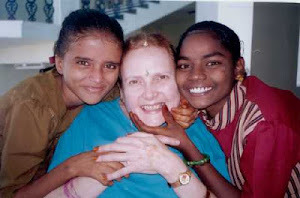 In 1995, with Colin’s help, she set up a charity for disabled children in South India. It gave her a sense of purpose in life that radically transformed the ensuing years. This changed perspective taught her the danger of euthanasia, which encourages people to make ultimate choices at a low point in their lives, on the assumption that it will never change for the better.